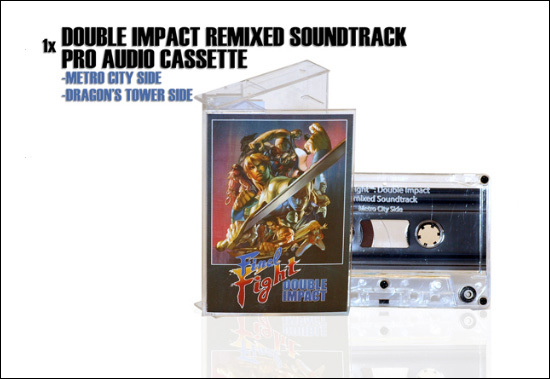 Hopefully Not The Final Time: Final Fight Double Impact Gets Merch! April 11, 2010 | Audun Sorlie | 4 Comments Share this Hopefully Not The Final Time: Final Fight Double Impact Gets Merch! For everyone who has grown up with a big brother, I am sure you’re all all to familiar with the ancient law that requires them to beat you up all through your childhood. It seemed like every day you would trigger something in them that just made them wanna punch you, right in the face. Luckily for me, my brother managed to steer his lust of sibling violence to video games, and most of my young days was spent next to my brother playing the different fighting games he would pick up. Among one of my best memories in life, is standing next to him on a crate playing Final Fight in the arcades. Fast forward 20 years, we’re now in the couch, several pounds heavier and with peach fuzz beards playing the same game as it is released on XBLA under the title Final Fight: Double Impact. As a series almost forgotten by Capcom, it never really got a big line of merchandise outside of a few CDs and a crossover episode on the Street Fighter Saturday morning show. But now Capcom has been sending out a press kit with loads of Final Fight related swag including t-shirts, hairspray and a tape with arrangements done for the XBLA release by Simon Viklund, who also worked on Bionic Commando: Rearmed! I need to get my hands on this baby!